You might have an old TV but new home theater or old TV and new digital set top box from time Warner and trying to figure out what devices are compatible and how to get the best out of these devices. Here are some comparisons between HDMI Vs DVI Vs Component Video Vs S-Video Vs Composite video to help you interconnect those devices and know what to expect. HDMI stands for High definition Multimedia interface. It has high Definition Digital Video and Digital Audio in single cable. Standard HDMI cable can transmit 1080i or 720p video – these HD resolutions that are commonly associated with cable and satellite television, digital broadcast HD, and up scaling DVD players. Standard HDMI cable with Ethernet offers the same baseline performance as the Standard HDMI Cable (720p or 1080i resolution), plus an additional, dedicated data channel, known as the HDMI Ethernet Channel, for device networking. This is suitable for new devices that support data connections. High Speed HDMI cable supports resolutions of 1080p and beyond, including advanced display technologies such as 4K, 3D, and Deep Color. If you are using any of these technologies, or if you are using 1080p display such as a Blu-ray Disc player, this is the recommended cable. High Speed HDMI Cable with Ethernet has the same baseline performance as the High Speed HDMI Cable shown above (1080p resolution and beyond), plus an additional, dedicated data channel, known as the HDMI Ethernet Channel, for device networking. HDMI Ethernet Channel functionality is only available if both linked devices are HDMI Ethernet Channel-enabled. This is suitable for new devices that support data connections. It supports HDCP copy protection that does not allow conversion of video to analog for compatibility with older HDTV’s and other displays. There are some compatibility issues due to early adopters not implementing the standards correctly. The new HD Audio formats – Dolby TrueHD and DTS-HD are also supported. DVI stands for Digital Visual Interface. Many HDTV’s, computer monitors, DVD’s and set top Boxes for Satellite or Digital Cable TV have these connectors. 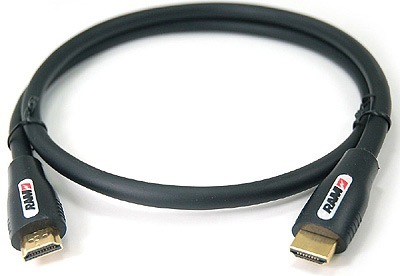 DVI was developed with VGA connector standard. DVI is designed to carry digital video data to a display. DVI is partially compatible with HDMI standard in digital mode (DVI-D), and VGA in analog mode (DVI-A). It has been superseded by HDMI in televisions. The DVI standard has wider acceptance in the PC industry (both in desktop PCs and monitors). Both DVI and HDMI deliver the signal in a digital format. HDMI and DVI are both all digital, they also are all based on similar specifications since HDMI was derived from the DVI specification. HDMI incorporates content protection called High Definition Content Protection (HDCP) while DVI does not. Component video is a video signal that has been split into two or more components. When this term (“Component Video”) is commonly used, it refers to an Analog video that is transmitted as three separate signals. RGB analog component video does not support Digital Rights Management. When people discuss component video, the Y’PbPr (or “Yipper”) scheme is usually what is meant by them. Cable is color coded GREEN=Y’ BLUE=Pb and RED=Pr. DVD players, video projectors, plasma displays, and other electronic devices use this. It is designed to be used in analog systems. It was developed to save on cable bandwidth requirements and provide enough separation of the signal to provide a quality image. S-Video and composite video mix the signals together by means of electronic multiplexing, causing degraded signal when display is not able to separate the signals properly. YPbPr, like other forms of component video, offer enough separation of the signals so the quality of the final video is quite identical to the original signal. A Component Video connection is capable of transmitting 720p and 1080i video streams. Which is similar to HDMI. The Component standard doesn’t support audio. It is usually paired with two analog connections . Thus sound is not as great as compared to HDMI. The luma, transmits information in black and white while chroma transmits all the color information. When these signals are sent to a receiver such as a television set, it results in sharper images than composite video(where video information is transmitted as one signal over one wire). It however does not support high definition video signals. Composite video is the format of an analog signal. As name suggests it contains all video information in a single signal. 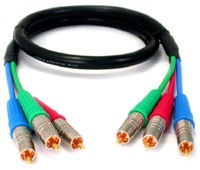 Composite video cables do not carry audio and do not have high definition video support. HDMI is digital while composite is analog which gives HDMI an upper hand when it comes to sound and video quality. HDMI can carry audio and video signals. In Stereo Analog Audio RCA connectors use encoded in red and White color. These support stereo and often mono analog audio. There is however no support for surround sound. These are pretty basic on most commercial TV,DVD players.